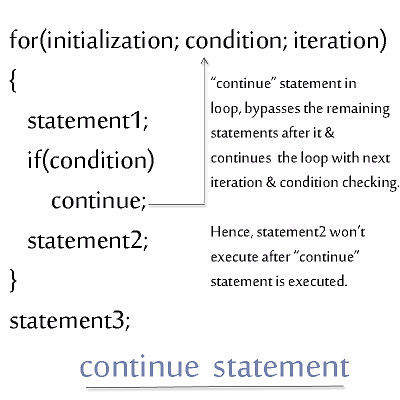 In C language, we may use continue statement within a loop and when a continue statement is encountered in a loop of a program in execution, it skips executing the rest of statements in the loop for that particular iteration and the program continues with the next iteration and condition checking in the loop. As you may see in the output of the program, when continue statement was encountered within an executing for loop, it skipped executing the printf() statement in the loop for that particular iteration i.e. when it is equal to 2. The program continued normally with the next iteration(i is equal to 3) and condition checking.